Property 22: 5 minutes from Sarlat, character house renovated, nice view, large swimming pool. Property 32: Cute, little house with beautiful view, within walking distance of a large lake with beach. 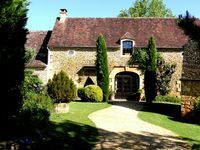 Property 44: Romantic stay in two cottages near &quot;Lac du Causse&quot;. Property 49: Cottage 4/6 people in a holiday village *** in Montignac Lascaux.